Blast head coach Danny Kelly retired from professional play at the end of the 2005-06 season, after winning his third championship as a Blast player. His 14-year playing career included five All-Star selections, three Championships and the distinction of being one of the most recognized indoor soccer players in Baltimore and Harrisburg. Kelly was named head coach of the Blast in May of 2006 after serving as the interim head coach for the last five games of the 2005-06 regular season and leading the team to the 2006 Championship. In his first full year in the position, he coached the team to a 15-15 record. He has since led the team to Championships in 2008, 2009, 2013. and 2016 while including championship appearances in 2011 and 2012. Kelly boasts a 133-60 regular season record, a 20-9 postseason record and was named MISL Coach of the Year both in 2011 and 2013. He was also named the 2009 NISL Coach of the Year. 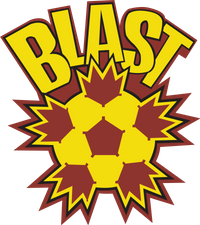 Kelly began his professional indoor soccer career with the Harrisburg Heat during the 1991- 92 season after the Heat drafted him in the Territorial Round of the 1991 draft (fourth overall pick). He played for the Heat until the 1998-99 season when Ed Hale and Kevin Healey took over control of the Blast and acquired Kelly in a trade. After six seasons with the Heat, Kelly still ranks in the top five in several Heat all-time categories including first in one-point goals (78) and fifth in points (528). Kelly represented the Blast in the 2006 and 2004 MISL All-Star Games and played for the Heat in the 1996 All-Star Game (after recording a career-high 140 points). He was also voted to play in the All-Star Games in 2001 and 1999 but did not play due to injuries (groin and ankle, respectively). He still ranks eighth all-time on Baltimore’s points list (329). In his career, he recorded 100 or more points in three seasons, played in three All-Star Games and earned two All-League selections (2006 and 1996). He attended Penn State University and was a freshman All-American in 1987. David Bascome, who played professional indoor soccer for 17 years, is entering his tenth season as Danny Kelly’s assistant coach. He was named to the position on October 12, 2006 and has since helped lead the team to the 2008, 2009, 2013, and 2016 Championships. During his 17-year playing career, Bascome won three championships, all with the Blast. He attended Anderson Community College in South Carolina.